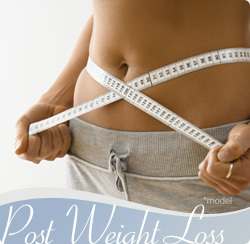 Patients who have undergone extreme weight loss are often left with excess skin and a deflated look. The areas typically affected include the abdomen, back, thighs, breasts, arms, face, and neck. The treatment of these problems require not only safe and effective surgical techniques, but a good plan that will optimize patient safety, outcome, and expense. Our plastic surgeon, Robert Rothfield, MD, has extensive experience in treating massive weight loss patients, which enables him to create a comprehensive and individualized surgical plan. Customized surgical plans may combine procedures and involve several stages to help his patients achieve their goals. For more information about post-bariatric surgery or to schedule a complimentary consultation with Dr. Rothfield, please contact us at Weston Plastic Surgery. In cases of extreme weight loss, patients are often left with excess skin not only in the abdominal region but in the back and flanks as well. The circumferential body lift technique allows loose skin to be removed from the entire midsection to give a more ideal and proportionate appearance. This flattens the abdomen like a tummy tuck and at the same time lifts the lateral thighs, flank, back, and buttocks. Following significant weight loss or as a natural result of aging, the skin of the upper arms can hang down creating a “batwing “ type of deformity. An arm lift is an operation that removes the loose excess skin and restores a tighter natural contour. In some patients there may also be areas of extra fat on the arm that need to be addressed and in these cases the procedure can be combined with liposuction techniques. Although the thighs may be one of the last body areas to be addressed after weight loss, they can be an area of major concern for many patients who have completed the first stages of body contouring. The thigh lift is a surgical procedure that removes excess skin from the inner thigh. The effect of massive or even significant weight loss often creates a drape of crepe-like hanging skin in the inner thigh region. Weight loss, in combination with the effects of aging, gravity, and a loss of skin elasticity, all contribute to this sagging appearance. By removing the excess skin, thigh lift surgery works to improve the contour and look of the leg. In some patients there may also be areas of extra fat in the thigh that need to be addressed and in these cases the procedure can be combined with liposuction/liposculpture.